Increasing environmental pressures appearing over the last few years have led to important changes in the field of wood protection. In this context, new technologies, based either on thermal or chemical modifications, suggest increasing interest in prospect of programmed ban of biocide products. The evolution of the regulations on the use of biocide products has led to important changes in the field of wood preservation, leading to an increasing interest for non-biocide treatments like thermal or chemical modifications to face to the programmed ban of biocide products. The paper reviews the different non-biocide alternatives developed currently on an industrial scale, highlighting their main characteristics and applications. Different treatments have been developed on an industrial scale involving mainly thermal modifications and acetylation, furfurylation and DMDHEU constituting already available solutions. Different non-biocide alternatives already exist and will become more important in the next decades due to the increasing legislative pressure driven by environmental considerations. Chemical modification of wood has received a lot of attention since the middle of the 20th century. The main objectives of these modifications depend on the final use of the material. In the case of solid wood, chemical modifications are intended to improve the material’s properties like its dimensional stability, mechanical properties or resistance to biodegradation, while in the case of divided wood, modifications are aimed at modifying or improving behaviour of particles or fibres for utilisation for given applications like composites, paper or new materials. From a chemical point of view, wood is a natural composite constituted mainly of three polymers—cellulose, hemicelluloses and lignin—and to lesser extent of low molecular weight compounds called extractives. The chemical structure of these components directly influences wood’s chemical reactivity. The main chemical group present in wood cell wall biopolymers is the hydroxyl group, which is in great part responsible for wood affinity for water and of its chemical reactivity. Hydroxyl groups are present as primary or secondary alcohols in cellulose, hemicelluloses and lignin, as well as phenolic groups in lignin. The aromatic structure of lignin also constitutes another possibility to perform chemical modifications of wood through reactivity of aromatic nuclei. Additionally, some other less important functional groups like carbonyl or carboxylic acid groups can be involved in wood reactivity. Even if many investigations have been performed on wood chemical modification, only a few of them have led to practical applications. Several reasons can explain these difficulties in adapting academic research results to an industrial scale. One of these reasons concerns the low reactivity of wood polymers, which involves the use of highly reactive species and catalysts to allow the reactions to take place. Another reason concerns the problems of accessibility of the reactants into the wood structure, which depend on the anatomy and impregnability of each wood species. Therefore, polar solvents are often required to improve penetration of reactants in the wood cell walls, where they should react with biopolymers. Increasing environmental pressures over the last few years have led to important changes in industrialised countries with regard to sustainable development and especially in the field of wood preservation. Conventional wood preservation systems generally involve impregnation of broadly active biocides into the wood. However, these techniques are under increasing scrutiny with respect to their environmental impacts, which may limit their applications in the future. This has led to new opportunities for the development of ‘non-biocidal’ alternatives based on chemical or thermal modification of wood (Schultz et al. 2007). Numerous methods have been described in the literature during the last century to modify wood. There are excellent books dealing with wood chemical modification presenting academic research performed in this area, as well as industrial applications with the development of new materials resulting from these investigations (Rowell 2005; Hill 2005). However, only a few of them have led to industrial development. The aim of this paper is to make an assessment of the main chemical modifications of wood, which currently find, or will find in the near future, opportunities for development from an industrial point of view. Chemical modification of solid wood is generally investigated to increase wood dimensional stability through reduction of its affinity to moisture and to improve its resistance to biodegradation. Several strategies have been described to reach these scopes. The first one concerns chemical modification of hydroxyl groups of wood cell wall polymers through esterification, carbamatation or alkylation reactions; the second one concerns impregnation of polymerisable monomers or resins into the wood structure to form after in situ polymerisation wood polymer composites. According to the method used, the mechanism of stabilisation differs. In the case of reactions involving modification of wood hydroxyl groups, stabilisation is due to the reduction of free sites able to bind water through hydrogen bonds, but also to the bulking effect of groups grafted on wood. In the case of wood polymer composites, stabilisation is due either to the capacity of the polymer to fill the lumen reducing the accessibility to water and micro-organisms or to cross-linking of wood components. Acylation of wood has been extensively studied using a wide range of chemicals, among them, acid anhydride, acyl chloride, ketene or even carboxylic acid (Rowell 2005; Hill 2005). However, in spite of this large number of studies, only a few of them have led to industrial development. The reasons for this gap lie in the difficulties to transfer and adapt results obtained on a laboratory scale to an industrial one, due to environmental, economical and technological problems. The most promising and the most investigated acylation reaction is probably wood acetylation (Fig. 1). Different reagents like acetic anhydride (liquid or vapour), vinyl acetate or ketene have been investigated (Rowell et al. 1986; Rowell et al. 1985; Jebrane et al. 2011). The main advantage of these reactions is to obtain modified wood free of all by-products or starting materials. Indeed, ketene allows acetylation of hydroxyl group of wood cell wall polymers without forming a by-product, while acetic acid formed during acetylation with acetic anhydride is easily removed by heating under vacuum. The reaction of wood with acetic anhydride can be carried out with or without catalyst in a range of temperatures between 100 and 130 °C followed by a vacuum step to remove unreacted anhydride and acetic acid (Rowell 2006; Minato and Ito 2004; Obataya and Minato 2009). Microwave energy is also shown to be efficient for the modification of wood by means of acetylation with acetic anhydride (Brelid and Simonson 1999; Brelid et al. 1999). Acetylation can be performed on solid wood or on particles (flour, chips, flakes, fibres, etc.). Acetylated wood presents higher hydrophobicity and dimensional stability (Özmen 2007; Rowell 2006; Ramsden et al. 1997; Rafidah et al. 2006). Studies performed with different wood species indicated that equilibrium moisture content decreased as the degree of acetylation increased, while mechanical properties were unchanged or only slightly affected (Rowell and Banks 1987). It was found that wood species had no significant effect on dimensional stabilisation as long as similar weight gain levels were obtained. Anti-swelling efficiency values of 60 % were obtained for weight percent gain of 15 %, while failures and cracks were observed for higher acetyl contents (Rowell et al. 1987). Acetylation also improves wood resistance to termites and micro-organisms like fungi and bacteria (Tillman 1987; Wang et al. 2002; Hill et al. 2006; Hill et al. 2009; Mohebby and Militz 2010; Gascón-Garrido et al. 2013), constituting an attractive alternative to classical wood preservation methods based on the use of biocides, even in contact with soil. Acetylation is also reported to inhibit photodiscolouration and photoyellowing of wood through a reduction of the formation of coloured chromophores on the wood surface (Pu and Ragauskas 2005; Chang and Chang 2001). Studies performed on extracted lignin indicated that photostabilisation of acetylated lignin during light irradiation may be attributed to the acetylation of phenoxy and aliphatic hydroxyl group in lignin (Pu and Ragauskas 2005). Acetylation has been also widely used to improve properties of wood composites. Acetylation of wood flakes prior to flakeboard manufacturing has been shown to greatly improve the dimensional stability of the finished products. Due to the reduction of the fibre saturation point and equilibrium moisture content, penetration of water soluble resins and, consequently, adhesive bonding of wood particles are very poor, leading to failure at the adhesive/wood interfaces (Mohebby et al. 2009; Rowell et al. 1987). The effect of acetylation was also examined on bending strength of finger jointed beech wood used for external joinery (Papadopoulos 2008). Results indicated that chemical modification caused a significant decrease of MOR and MOE values. Acetylation was shown to have no effect on the drying characteristics and adhesion of coating (Beckers et al. 1998). It also considerably improved their weathering performance. Regioselectivity of reaction of acetic anhydride with wood cell wall components indicated that even if lignin is reported to react more rapidly than other wood polymers (Boonstra et al. 1996), carbohydrates were also acetylated. There have been several attempts in the past to develop commercialisation of the wood acetylation process, but these were unsuccessful because of an unfavourable economic climate. However, because of the increasing interest in the development of renewable resources and of the restriction of use of different wood preservatives due to the application of the Biocidal Products Directive of the European Parliament adopted in 1998, new opportunities have appeared. The Titan Wood Company was formed in 2003 and started to produce acetylated wood in 2005 at Arhnen in The Netherlands using a pilot plant acetylation reactor of 2300 L capacity. Acetylated wood are sold under the trade name ACCOYA®. Mixed acetic-fatty esters have been also reported recently to allow modification of wood (Peydecastaing et al. 2009) (Fig. 2). This method permits the grafting of acyl groups on wood leading to dimensionally stable treated wood bearing acetyl and fatty acid acyl chains, showing improved water repellency, which was recently unsuccessfully marketed by Lapeyre under the trade name of Wood Protect. N-methylol compounds, like 1,3-dimethylol-4,5-dihydroxyethyleneurea (DMDHEU), are used as a wrinkle-resistant finish in the textile industry. They are, therefore, expected to enhance the resistance of wood to weathering because they can cross-link the cell wall and dimensionally stabilise wood (Fig. 3). DMDHEU was used to modify wood blocks to different weight gain reducing significantly the degradation of wood exposed to artificial weathering and preventing the degradation of the wood cell wall polymers (Xie et al. 2005). Pore size distribution determined by differential scanning calorimetry indicated that DMDHEU reduced the pore size of the samples by occupying the void space present in the cell wall (Dieste et al. 2009a). DMDHEU-modified wood appears to be more hygroscopic than unmodified wood due to the increase of OH groups caused by the modification with DMDHEU (Dieste et al. 2008a). The effects of wood modification with DMDHEU on the coating performance of solvent and water-borne finishes were investigated by several authors. Xie et al. (2006) demonstrated that modification of the wood substrate with DMDHEU is compatible with both water-borne and solvent-borne finish systems and improves their wet adhesion on the wood surface. Petrič et al. (2007) investigated wettability of commercially available acrylic water-borne coatings on oil heat-treated and DMDHEU-modified Scots pine wood. Even if these treatments increased the hydrophobic character of wood, they have no negative effect on wetting of wood surfaces by water-borne coatings, which exhibited much better wetting on modified substrates than on unmodified substrates. The gluing ability of plywood produced with DMDHEU-modified veneers was also investigated (Dieste et al. 2009b). The shear strength, the cohesive wood failure and the delamination were determined in plywood made with DMDHEU-modified veneers of beech, birch and pine using phenolic resins. Even if the samples constructed with unmodified veneers presented higher shear strengths and higher cohesive wood failures than the samples constructed with modified veneers, all shear strength values obtained met the European requirements of plywood designed for exterior conditions. The dimensional stability and mechanical properties of plywood produced with DMDHEU-modified veneers were also measured (Dieste et al. 2008b). The mechanical properties tested were Brinell hardness, modulus of elasticity in bending (MOE), bending strength (BS) and work to maximum load in bending (WMLB). Plywood made from DMDHEU-modified samples presented higher dimensional stability, while MOE and BS were unaffected. The WMLB decreased in the modified samples and Brinell hardness increased. The effect of treatments with DMDHEU alone or in combination with magnesium chloride as catalyst on the tensile properties of pine wood was also investigated (Xie et al. 2007). The results indicated considerable strength losses of all treated samples. The higher strength losses observed in the case of catalysed reactions were attributed to hemicelluloses degradation. Microscopic observations revealed that catalysed DMDHEU treatment changed the predominant failure mode from interfibre fracture in untreated samples to intrafibre fracture. The mechanical strength of DMDHEU-treated wood has been studied by Yuan et al. (2013) with different catalysts and different treatment temperatures. No strength loss has been observed for mild curing condition, while harder curing conditions result in a significant decrease of the mechanical strength properties. Another recent study performed on DMDHEU-treated poplar indicates an increase of the hardness and of the compression strength perpendicular to grain, while MOR and impact strength decreased as the WPG increased (Jiang et al. 2014). The protection mechanism of DMDHEU-treated against wood-rotting fungi was investigated by Verma et al. (2009). The decay resistance of beech- and pine-treated blocks treated increased with increasing weight percent gain (WPG) of DMDHEU, full protection being reached at WPGs of approximately 15 % (beech) and 10 % (pine). The same authors investigated metabolic activity of the fungi in the wood blocks (Verma et al. 2008). Fungal activity depends on the WPG and on the mass loss caused by the fungi, but is detected even in wood blocks of the highest WPG, showing that the treatment was not toxic to the fungi. It can be considered, therefore, as a ‘non-biocidal’ alternative to classical preservation methods involving the use of biocides. More recently, DMDHEU-modified wood has been shown to be resistant against Mediterranean termites (Gascon-Garrido et al. 2013) as well as against marine borers (Lopes et al. 2014). Boric acid and phenylboronic acid have been added into aqueous solutions of DMDHEU to improve wood durability (Yalinkilic et al. 1999). DMDHEU reduced boron leachability, while boron appeared to decrease cross-linking efficacy of DMDHEU. Decay resistance against brown- and white-rot fungi increased considerably. The Belmadur process based on DMDHEU utilisation is marketed by BASF. The treatment is realised in two stages: the first stage consists of impregnating the wood with an aqueous solution of a cross-linking agent using classical vacuum-pressure impregnation plant. The second stage consists of drying the impregnated wood at a temperature of more than 100 °C causing reticulation of the DMDHEU resin. Wood modification with furfuryl alcohol is a non-toxic alternative to conventional preservation treatments. This process, which has been known for several decades, is based on in situ polymerisation of furfuryl alcohol (Fig. 4). Recently, the use of furfuryl alcohol obtained from renewable hydrolysed biomass waste and improvement of the polymerisation process, has led to the development of commercial production according to the Kebony technology, mainly for flooring purposes (Lande et al. 2008). The properties of furfurylated wood depend on the retention of grafted/polymerised furfuryl alcohol in the wood. According to the modification levels, a wide variety of properties like dimensional stability, hardness, MOR, MOE, resistance to decay and insect attacks were improved (Epmeier et al. 2004; Lande et al. 2004a). Equilibrium moisture content decreases after fufurylation (Epeimer et al. 2007). Two main processes for production of furfurylated wood have been developed for Kebony ASA: KebonyTM for hardwood modification and VisorWoodTM for softwood modification. NMR investigations with soluble lignin models indicated that the furan polymer grafts to lignin, supporting observations made with wood materials (Nordstierna et al. 2008). Toxicity of furfuryl alcohol may constitute a drawback for this treatment, however, toxicity is strongly reduced after polymerisation. Ecotoxicology of furfurylated wood and leachates from furfurylated wood were reported in different studies (Lande et al. 2004b; Lande et al. 2004c; Pilgard et al. 2010a, b). Results showed no significant ecotoxicity, while combustion did not release any volatile organic compounds or polyaromatic hydrocarbons above normal levels for wood combustion. Similarly, Vetter and colleagues demonstrated that furfurylation is capable of protecting the wood adequately for applications under use class 3 conditions without posing a threat to the environment (Vetter et al. 2008). Furfurylation of wood is, therefore, believed to be a safe process for the environment. Accelerated weathering tests show that furfurylation provided lower colour changes than controls after 800 h exposure to UV-light irradiation and water spray (Temiz et al. 2007). Surface mould growth on furfurylated, acetylated, oil heat-treated and heat-treated wood substrates coated with three different coating systems exposed to outdoor conditions was also investigated (Gobakken and Westin 2008). The degree of mould growth mainly varied with time and the type of paint. Of the different modified wood substrates, furfurylated wood had the lowest degree of mould growth and acetylated had the highest. No differential patterns in susceptibility to various fungal species were detected on the surface of the different coated wood substrates. Thermoset resins have been used to develop some wood polymer composites with commercial applications. Compreg and Impreg treatments were developed in the 1960s in the USA. These treatments are based on the impregnation of phenolic resins into the wood structure, which after curing, greatly improves wood resistance to decay, termite and marine-borer attacks. Impreg treatment involves impregnation of phenolic resin in the wood, which was cured at a high temperature, maintaining the cell walls in a permanent swollen state (Stamm and Seborg 1962). Compreg treatment, however, involves impregnation of phenolic resin in the wood, which was cured at a high temperature under compression to reduce shrinking and swelling and to increase density and strength (Stamm and Seborg 1951). Products resulting from both of these treatments have been used for the manufacture of knife and tool handles, and musical or electrical instruments, for example, but not directly for preservation purposes. Vinyl monomer impregnation followed by in situ polymerisation represents another promising way to enhance mechanical, dimensional and thermal stability as well as fungal and insect resistance of low natural durability wood. Different commercially available vinyl monomers, among which are acrylonitrile, glycidyl methacrylate, methyl methacrylate, hydroxyethylene methacrylate, ethylene glycol dimethacrylate, butyl acrylate, butyl methacrylate, styrene, acrylamide or acrylonitrile have been investigated (Mathias and Wright 1989; Şolpan and Güven 1998; 1999a, b, c, d; Devi et al. 2004; Zhang et al. 2006; Ajji 2006; Devi and Maji 2007; Kumar et al. 2008; Li et al. 2010). According to the nature of the monomer used, polymerisation can take place either in the cell lumens, in the cell wall or in both (Mathias and Wright 1989; Schneider 1995; Cleland et al. 2009). Impregnation of polyglycerol methacrylate obtained from renewable agricultural by-products followed by in situ polymerisation initiated by free radical initiator, was described as an attractive alternative to conventional wood preservation procedures using broadly active biocides (Soulounganga et al. 2004). Polymerisation can be initiated by different means using either thermal free radical initiator or gamma radiation. Gamma radiation was reported by different authors to be an efficient method to initiate polymerisation (Thomas et al. 1993; Sheikh and Taromi 1993; El-Awady 1999; Ajji 2006; Gago et al. 2007). X-rays, derived from a high-energy, high-current electron beam can be also used to initiate in situ polymerisation of vinyl monomers. X-rays initiated polymerisation and penetrated through thick pieces of wood, where polymerisation took place allowing polymerisation of the monomers in the cell walls of wood. Having entered the cell walls and then being polymerised within the cell walls, these radiation-cured treatments increase dimensional stability of treated wood (Cleland et al. 2009). Research on thermally modified wood has been the object of important investigations for several decades. Even if the effects of the heat treatment on wood durability have been known for a long time, its industrial exploitation is still recent. In the 1970s, l'École des Mines de Saint-Etienne (France) developed an industrial heat treatment process called retification leading to commercialisation of retified wood resulting from the NOW process (New Option Wood). At the same time, research undertaken in Finland led to the development of the Thermowood process. Simultaneously, other technologies were developed like the PLATO process in the Netherlands, Menz Holz OHT process in Germany (Stingl et al. 2002; Boonstra et al. 2007). In recent years, new technologies have been developed and commercialised on the market like wood heat treatment in pressurised closed conditions like WTT and IWT (Molrup) in Denmark or wood heat treatment under vacuum like Termovuoto in Italia and Timura in Germany. Several other sites of heat treatments were set up in recent years in various European countries and in North America leading to the production and commercialisation of heat-treated wood under different trade names such as Oleobois, Retiwood, BMT, and Bois Perdure. In 2012, for example, 13 production plants based on different technologies were counted in France (Abibois 2012). The industrial development of thermally modified wood was favoured by the increasing environmental pressure on the use of biocides leading to the progressive disappearance of different preservation products used up to now. All these technologies involves wood heat treatment at high temperatures between 180 °C and 240 °C under an oxygen free atmosphere to avoid burning involving either the use of steam, nitrogen or oil (Militz 2002). Heat treatment modifies the structure of wood cell wall polymers through different chemical reactions conferring to the material new properties. Heat-treated wood possesses new properties like improved dimensional stability and decay resistance, while its strength decreases more or less according to the treatment conditions (Tjeerdsma et al. 1998; Santos et al. 2000; Alén et al. 2002; Kamdem et al. 2002; Pétrissans et al. 2003; Gosselink et al. 2004; Hakkou et al. 2005a-c and 2006; Yildiz et al. 2005; Yildiz et al. 2006). Due to the improvement of durability towards wood-rotting fungi, heat-treated wood is considered a ‘non-biocidal’ alternative to classical wood preservatives for applications in hazard classes 2 and 3. The main characteristics of the different heat treatment processes are described below. Currently, Finland is the first producer of heat-treated wood with at least 10 operational production sites. An industrial scale heat treatment process, developed at VTT in cooperation with the Finnish wood product industry, produced in 2007 a little more than 80,000 m3. The ThermoWood process is licensed to the members of the Finnish Thermowood Association. This process comprises three main phases. During the first phase, wood is dried at a high temperature using heat and steam. The kiln temperature is rapidly raised to 100 °C, followed by a slower temperature increase to 130 °C allowing reduction of the wood moisture content near to zero. After this, the kiln temperature is increased to temperatures between 185 and 215 °C for 2 or 3 h. The last phase concerns cooling and moisture conditioning to bring the wood moisture content to content between 4 to 7 %. The atmosphere made up of overheated steam prevents cracks and induces thermohydrolysis reactions. Initially developed by New Option Wood (NOW), this process corresponds to a mild pyrolysis of wood under an inert atmosphere constituted of nitrogen or carbon dioxide emitted by the gas-burners used to heat the kiln. The temperature is progressively increased up to 240 °C, a temperature at which retification takes place. Thermodegradation and reticulation reactions confer new properties to wood like reduced hydrophilicity, higher dimensional stability and improvement of decay resistance. The name of retification given to this process is a contraction of reticulation and torefaction. The Perdure process is another technology currently in Quebec that is relatively close to the retification process described above. Wood is heated under an inert atmosphere in an oven using propane gas and electricity at a temperature between 200 and 230 °C. When the final temperature is attained, the temperature is maintained for a predetermined amount of time during which thermo-transformations occurred, before cooling by steam injection and conditioning. The Plato process is constituted of different stages. The wood is first dried in a conventional industrial wood kiln to a moisture content of 14 to 18 %. After this first stage, wood is subjected to a hydro-thermolysis stage in a stainless steel reactor at temperatures between 150 and 180 °C in an aqueous environment using saturated steam as the heating medium. During this stage, hemicelluloses are strongly degraded through hydrolysis reactions, while cellulose remains intact, which is crucial to ensure final mechanical properties. The following stage concerns drying in a conventional industrial wood kiln to a moisture content of 8 to 9 %. Curing stage, during which thermo-reticulation occurred, is realised in a special stainless steel curing kiln at 150–190 °C under dry conditions leading to a material with moisture content near to zero. The last stage is a conditioning stage during which the moisture content of wood is elevated to a level of 4 to 6 %. Contrary to the preceding processes, where wood is heated under nitrogen or steam to avoid combustion, oil heat treatment processes involve heating of wood in vegetable oil (sunflower, rapeseed or linseed oil). Such processes were developed in Germany by Menz Holz GMBH Company but also in France with the Oléobois process. Wood is immersed in hot oil and heated at temperatures between 180 and 220 °C to ensure optimal durability without strength reduction. Commercialised by WTT and IWT companies, pressurised conditions involve higher steam pressure leading to higher relative humidity which exerts significant influence on both physical and chemical changes of wood during the treatment. Humidity softens the amorphous polymers in wood cell wall, thus increasing their flowability and reactivity at lower temperatures comparatively to other processes (Borrega and Kärenlampi 2008). Besides higher pressure, a partial vacuum environment has also been tried as an alternative treatment medium to limit oxygen concentration. Heat transfer under vacuum is performed either by conduction or convection. Volatile products formed during wood thermodegradation, like acetic acid, formic acid or furfural, are removed from the equipment during the treatment limiting the degradation of polysaccharides and recondensation reaction in the wood making these processes milder than others processes (Candelier et al. 2013a, b). Compared to the convection heating system, the conduction system using hot plates permits better heat transfer and limits wood deformation, treating a thin section of wood. Heat treatment modifies the structure of wood cell wall polymers conferring new properties to the material. The conditions of heat treatment directly influence the chemical decomposition of wood. Hardwoods are more susceptible to thermodegradation than softwoods. Thermal stability of the different polymers constitutive of wood differs according to their chemical structure: hemicelluloses present a lower degree of polymerisation and a higher reactivity due to their amorphous structures, which are degraded first, followed by lignin and cellulose (Hakkou et al. 2005c and 2006). The main volatile compounds are water, formic acid, acetic acid furfural resulting from degradation of hemicelluloses. Acetic acid formed during degradation of acetylated xylans catalyses depolymerisation reactions reducing the degree of polymerisation of hemicelluloses (Militz 2002). The presence of oxygen during heat treatment accelerates the degradation of wood components, considerably reducing the final properties of the material. The rate of degradation of polyoses under an oxidising atmosphere is higher than under an inert atmosphere (Kamdem and al. 1999; Yildiz and Gümüskaya 2005). 13C CP MAS NMR studies showed that hemicelluloses are strongly degraded after thermal treatment (Wikberg and Maunu 2004; Nguila et al. 2007). Cellulose, which presents a high degree of polymerisation and crystallinity, is generally considered as relatively resistant under heat treatment conditions used. The decomposition of lignin is observed for temperatures starting from 220 °C with the appearance of phenolic substances such as vanillin. Modifications of wood properties after heat treatment are mainly due to the thermal degradation of hemicelluloses (Yildiz and Gümüskaya 2005; Hakkou et al. 2006; Welzbacher et al., 2007). No noticeable degradations were observed for temperatures between 80 and 180 °C under nitrogen atmosphere (Hakkou et al. 2005b), while degradations appeared at lower temperatures under steam atmosphere. According to Weiland et al. (2003), wood heat treatment at temperatures between 200 and 260 °C causes important degradations of hemicelluloses with formation of acetic acid. Two main reactions occur during acid degradation of polysaccharides and especially of hemicelluloses: rupture of the β-(1-4) linkage between the different sugar units (arabinose, galactose, xylose and mannose) and a dehydration reaction of the resulting monomeric sugars leading to furfural or hydroxymethylfurfural, which can undergo further degradation (Fig. 5). Degradation of amorphous cellulose, more sensitive than crystalline cellulose, starts progressively as the treatment temperature increases, leading to modification of the ratio amorphous cellulose/crystalline cellulose observed generally in the literature (Sivonen et al. 2002). Kim et al. (2001) report that the minimal temperature to break up crystalline cellulose lies between 300 and 360 °C. These same authors also report that crystalline cellulose is weakly affected for temperatures under 300 °C. 5-methylfurfural and 5-hydroxymethylfurfural have been identified as cellulose degradation products of oak wood (Cutzak et al. 1999), while furfural results from degradation of pentoses present in hemicelluloses. It has been shown that dehydration products resulting from degradation of holocellulose are at the origin of the formation of carbonaceous material within the wood structure (Nguila et al. 2007). The behaviour of extractives during thermal treatment is less obvious. Volatile extractives, like terpenes, naturally present in wood can evaporate during the first stage of thermal treatment (Mohareb et al. 2010), while new extractives resulting from thermodegradation appear starting from 160 °C. These extractives can be subjected to further degradation reactions as the temperature and the treatment time increases, leading to the formation of by-products, which can remain in the wood or evaporate. Nuopponen et al. (2003) showed, using FTIR spectroscopy, that the heat treatment of the pine at temperatures ranging between 100 and 200 °C caused a migration of the extractives to the surface of the wood. Similar results were also recently described by Nguila Inari et al. (2011). Such a phenomenon modifies surface properties of heat-treated wood, influencing further applications like gluing or coating. Lignin undergoes depolymerisation due to cleavage of the different C-O bonds of C3 side chain and especially of β-(O-4) ether linkage (Fig. 6). At the same time, reactive intermediate species like carbonium ions, which can be formed during cleavage of benzylic C-O bond, are involved in recondensation reactions (Weiland and Guyonnet 2003). Aldehydes like formaldehyde, ethanal, furfural or hydroxymethylfurfural are also involved in reticulation reactions with formation of methylene bridges (Tjeerdsma et al. 1998; Sivonen et al. 2002; Hakkou et al. 2006; Wikberg and Maunu 2004). These reactions would be at the origin of the dimensional stability increase observed for heat-treated wood. 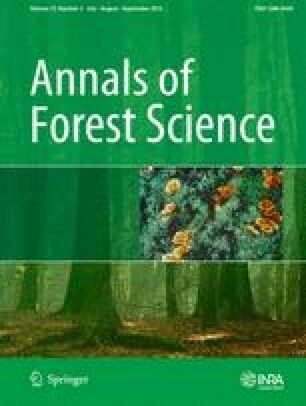 According to the literature, phenolic compounds formed during lignin thermodegradation have no effect on wood decay resistance of heat-treated wood (Weiland and Guyonnet 2001; Hakkou et al. 2006). Durability of heat-treated wood increases considerably (Kamdem et al.,1999; Tjeerdsma et al. 1998). Heat-treated wood at 280 °C becomes totally resistant to decay, but its mechanical properties are strongly affected. Resistance to decay depends of the temperature and duration of treatment (Welzbacher et al. 2007; Nguila Inari et al. 2009; Šušteršic et al. 2010). Chemical modifications occurring during treatment are believed to be at the origin of durability improvement. The fact that Trametes versicolor, able to degrade lignin as well as wood polysaccharides, was unable to attack heat-treated beech wood indicates that both degradation of hemicelluloses but also chemical modifications of lignin should be involved in the improvement of durability (Hakkou et al. 2006; Lekounougou et al. 2009). Heat treatment decreases the hygroscopic character and swelling of wood (Militz 2002). This behaviour has been explained by the degradation of hemicelluloses, which are the most hygroscopic polymers in wood and by thermo-reticulation reactions observed during treatment. Contact angle measurements before and after heat treatment indicate an important increase of wood hydrophobicity (Pétrissans et al. 2003). However, even if reduction of water sorption may influence decay development, no direct correlations were determined between improvement of durability and wettability changes (Hakkou et al. 2006). Modification of chemical composition of solid wood improves its properties like dimensional stability and resistance to biodegradation. Such modifications constitute attractive alternatives to classical preservation methods based on the utilisation of biocides. Among the numerous methods of chemical modifications described in the literature, only a few of them have led to developments on an industrial scale. Improvement of durability depends on the nature of the modification used. Chemical modifications performed by impregnation of different reactants into the wood structure followed by reaction of these latter ones with or without wood cell wall polymers lead to materials susceptible to be used for hazard class 3 or 4, while chemical modifications resulting from heat treatment are compatible for hazard class 2 and 3. Even if such modified woods represent only a small part of wood used currently, their utilisation becomes more and more important and will probably continue to increase in the following years. During the past decade, wood heat treatment has been successfully developed, leading to commercialisation of heat-treated products in several European countries. The development of chemically modified wood based on impregnation of chemical was more hesitant, even if some industrial production started a few years ago. It is obvious from the evolution of wood markets during recent years in Europe that utilisation of biocide-treated wood is becoming more limited due to environmental concerns. Chemically or thermally modified wood constitutes valuable alternatives to conventional preservation methods for different applications and is going to become more important. Thermally modified woods present interesting properties for applications in class use 3 corresponding to situation in which the wood is above ground exposed to weathering, while chemically modified wood, like furfurylated or acetylated woods, present performance allowing their use up to class use 4 corresponding to situation in which the wood is in direct contact with ground or fresh water. In all cases, the increasing legislative pressure driven by environmental considerations will support the future development of new technologies, which will become more important over the next decades. Such treatments today constitute an environmentally friendly approach to classical wood preservation based on relatively new technologies, especially for chemical modifications, which should be considered in the future as a completely new industrial processes, which can impact our environment and justify full life cycle assessment. However, controlled use of biocides will remain necessary for given applications, where thermally or chemically modified woods are not suitable or for curative treatments.